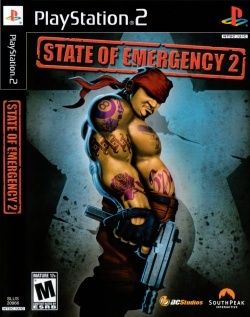 Game description: You can take part in gritty street riots, prison breaks, and all-out anarchy in State of Emergency 2. This game takes place four years after the first game, and your task is to rescue your friends who are being held in The Corporation's jail. Gangs, vehicles, and weapons are your aids as you wreak havoc in the city. In addition to the frenetic, mob-style gameplay of the original, there are stealth missions, arcade challenges, and a multiplayer mode for up to four players. This game takes place four years after the first game, and your task is to rescue your friends who are being held in The Corporation's jail. Gangs, vehicles, and weapons are your aids as you wreak havoc in the city. Ingame is heavily sliced and in software mode, environment graphics disappear and flicker, making it hard to tell where you're going. USA v02.20(10/02/2006), Hardware mode looks like watching a 3D movie,but with not the special glasses,,but a little better(some blurry)....Software mode looks good,but sometimes its possible with the use of camera the scenario become black. Description: When you move the camera most of the graphics disappear. Workaround: Go to Config > Emulation Settings > VUs tab, and set VU0 to "superVU Recompiler".